Zenfotec’s Java Certification Training is conducted by the professionals as per the industrial standards & demands. Java Certification based Training encompasses comprehensive knowledge on basic and advanced concepts of core Java. 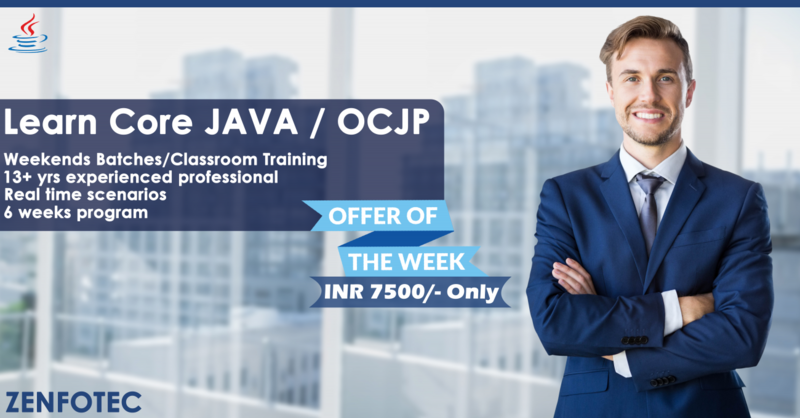 Oracle Java SE 7 Programming training focuses on the designing of object-oriented applications using the latest Java Development Kit (JDK) 7. Along with enhancing object-oriented thinking skills, the candidate learns how to build applications using the core Application Programming Interfaces (API). This Java for beginners course will further develop your skills in Java database connectivity (JDBC) to create database programs. The candidates with basic understanding of object-oriented principles, database concepts and Structured Query Language (SQL) syntax can undergo this training program. Having experience of developing code in any of the programming language will help the learners to understand and practice the course contents easily. I had taken up an Online Training course from Zenfotec for Core Java. I was given real time training with plenty of case studies. My trainer Mr. Niket is really an amazing teacher and a very nice person. He gave his 100% which helped in cracking interviews. I would like to thank Zenfotec’s Team for exceptional support provided to me during training and post training. I strongly recommend to anyone who is willing to learn Java to join Zenfotec.